Bodyboarding is a great, fun water sport that gets you into the sea and riding waves for hours on end. You won’t need us to tell you how enjoyable bodyboarding is if you’ve tried it before. Most people you give bodyboarding a try love it. If you’ve always wanted to try out beach sport but you’ve never quite been brave enough to try surfing (or it just isn’t for you), we’d definitely recommend bodyboarding. As well as being fun, bodyboarding is a great all-body workout that will get your arms and legs moving. Plus, you’ll be having a great time out in the sea under the sun, what’s not to love?! As with most sports equipment, you can hire bodyboards at the beach, but you can save money and get more out of it if you have your own board. With that in mind, we’re going to show you some of the best bodyboards for adults that you can buy cheaply online for under £35. Get your wetsuit on and get to the ocean. 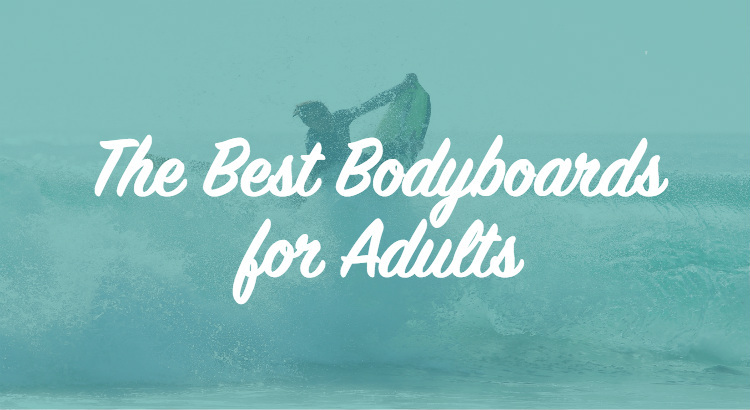 Here are our recommendations of the best adult bodyboards to buy online. We’ll tell you why we like them, why they’re worth spending your money on and also give you a link to where you can buy them on Amazon. 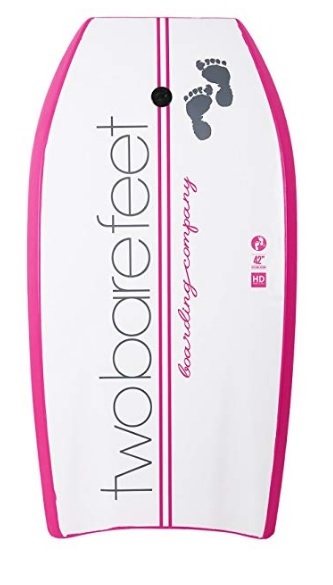 Two Bare Feet are one of the most popular names for affordable but quality surf gear.This Two Bare Feet bodyboard is 42″ board, so is an ideal size for adults of all sizes. The board features a soft surface deck for a comfort when you’re lying on the board and slick plastic bottom for extra speed and less drag through the water but also add strength to the board, preventing it from breaking and offering more flex from the board. Available in a wide selection of styles and colours. Also available in a shorter 41″ version, ideal if you’re a bit shorter. Gul, much like Two Bare Feet are well known for providing quality surf gear for low, affordable prices and their bodyboards are no different. A key part of the Gul Response is the curved crescent tail. This not only helps the streamlining of the board, but makes it easier for you to get onto the board as you try to catch waves. 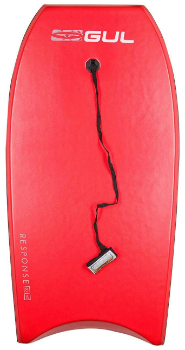 The Response features a hard slick bottom and soft deck. The board comes with leash strap. 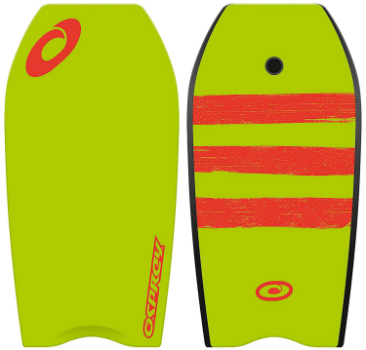 A great feature of this Osprey bodyboard is its distinct and vivid design, but it offers much more than cool styling. Built to be lightweight but durable, the Osprey board offers more control as the board is easy to handle, yet the slick plastic base offers durability as well as additional speed when on the water. The cheapest board on our list and it was a brand new board for 2018, the Gymax 42″ is a great budget option if you’re looking to spend something a bit closer to the £20 mark. As with all the bodyboards on our list, the Gymax board features a soft desk and slick plastic bottom – not lacking in features despite the much lower price tag. As well as the slick bottom, the Gymax board also features a crescent tail for added control when you’re on the face of the wave. The board is lightweight with a EPS strong core, so ideal for beginners, adults and children alike. If you’ve checked out our guide to the best beginner surfboards you might recognise this really cool board design. 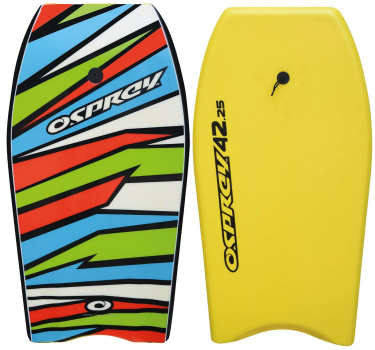 Osprey have taken their three-stipe design and used it to produce a great looking, high performance bodyboard. A great benefit of a smaller, 37 inch bodyboard is that you have complete control over the board. The board is smaller and lighter, so you can move it and wrestle it into the direction you want it to go with greater ease. Also available is Osprey’s spiral design and in a selection of colours. If you’re looking for something a little bigger, check out Osprey’s 41” version. From experience we can tell you that bodyboarding with a board that features a hard, slick base is much more fun than a regular soft board all around. You get lass drag from the smooth surface and as a result, more speed! This is why in our selection of the best bodyboard to buy online all feature soft decks and hard bases. This is what it means when you see “XPE deck with slick HDPE base” in the product descriptions online when you’re looking to buy a bodyboard. The soft top allows the board to be more comfortable when you lean on and mount the board, yet the hard base means the board will move quicker through the water and is stronger than cheaper soft boards that can easily break. 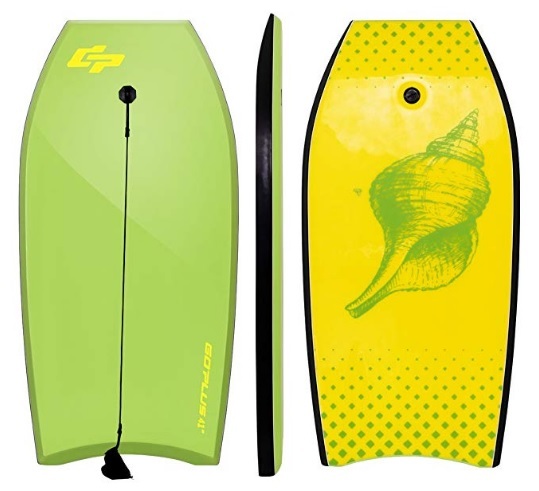 Your bodyboard will be put under different stresses, pressures and forces as you look to catch waves, jump on the board and manoeuvre it around in the water, therefore a strong core and the extra strength offered from an XPE (plastic) base will help you get more uses out of the board and more value for money. Which Size Bodyboard Do I Need? Unlike foam surfboards, you’re not putting your whole weight on a bodyboard, your legs will be dangling in the water, so buying a specific or the ‘right’ size bodyboard isn’t as important or as crucial to the performance of the board. The most common size for adults is 42″. As you’ll have seen from our recommendations above, many of the them are 42″ boards. However some people prefer a smaller board, such as a 37″ option as it allows them to move the board easier as they’re smaller and lighter, giving the rider more control. In contrast, some people like a larger size, like a 44″ board, as they offer more buoyancy from the increased surface area of the bigger board. If you’re not too sure, we’d recommend going for the average 42″ or 41″ size, as it gives you a perfect combination of control and support in the water.